One of our favorites for its ease of fitting in. It's wonderful for a casual glass of wine or a host of other beverages. 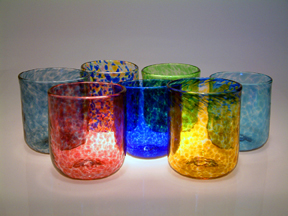 The Bistro Glass can also be used as a small vase and if you promise to use the kind that come in metal cups, tea lights! Fritted decoration is melted onto the surface during the blowing process. Fun, funky, and several colors to choose from. Color Choices:indigo, ruby, multi, cobalt, green, amber, turquoise, amber w/ cobalt rim.